I suspect most of the older buses are going to be peak extras. Last time I was there and took photos I certainly managed to snap some Tridents and B7s in central Brum just along from Moor St Station where there is a long array of stops. I haven't done Walsall, Wolverhampton or Coventry for a long while so am not up to date with what is running on what. I was in Birmingham just the other weekend but no time for buses. I did see the tram extension to New St for the first time and where they are building a further extension towards Broad Street. The latest batch of 'Platinum' E400's have started to be introduced, with the Route 9 and 50 the main recipients in Birmingham and the 11 in Coventry. The Birmingham examples also feature new style route branding; Route 9 & Route 50. This has allowed the 15-reg MMC's from the Route 50 to transfer to the 11A/C, these are also starting to receive new style route branding. And for trident fans, there are still a number of active examples ranging from Y-reg to 04 reg. Very nice, shame TfL can't come up with something similar. This looks a lot more stylish than what was trialled in Barkingside and Hayes. There was an article in 'Buses' magazine not so long ago, which proposed something similar (colour-coding) for LT-operated routes in Central London. 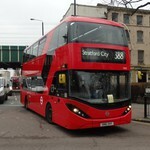 The buses would remain basically red but would have colour flashes somewhat like this. Given that most PTCs have landed in the hands of First or Stagecoach, or Arriva in the case of most of MTL, it is refreshing that WMT has ended up so much more distinctive under National Express. Really? It has taken National Express an awful long time to decide to spend some decent money on what is a big money spinner for them. While they've lost / surrendered a fair chunk of marginal work there are very few major competitors on any of NXWM's network. For a very long time the operation was marked by old buses that were not exactly well maintained which no doubt helped the bottom line in the short term but did little to make for an attractive travel offer. It is pleasing to see some decent buses going into Brum and some of the satellite towns in the West Midlands but the West Midlands bus network could be an awful lot better than it actually is. It's a while since I've been up there to ride around but there are some local or short journeys away from main corridors that are either impossible by bus or else tedious to undertake. Heck the last time I was in Brum I could have done with the bus albeit for a shortish journey. There were NO services in easy reach of New Street and as a result of diversions it was near impossible to work out what buses ran where. Worse despite Google showing bus stop positions on a road close to where I wanted to go no such bus stops actually physically existed on the road!! I assume the PTE had created the requisite electronic stop data which Google picked up from Traveline data feed but forgot to actually install real bus stops! In the end I had to walk as public transport as not an option. What a mess. While I was really referring to having a different operator owning WMT, I agree there have been shortcomings within NXWM. Some route changes go on endlessly, making it hard for enthusiasts never mind customers to keep up. I was shocked when I rode some (apparently) refurbished buses in 2016. They had the latest moquette but had clearly not been repainted internally or anything. 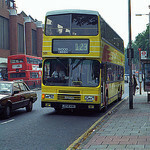 The 02-reg Trident on route 97 and not much newer volvo B7TL-Gemini were cases in point. How things change, when I was there in mid 1980s, was a mix of ex-Coventry Corporation Daimler buses (dating from about 1973) and Metrobuses (which were then newish), were all painted in the WM PTE white and blue (changed legally from 1986 to the Privatised version), but buses remained the same en after privatisation when I was there.